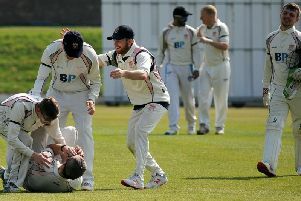 A special guest helped Blackpool to power on at the top of cricket’s Northern Premier League on a day all three Fylde coast clubs won convincingly. Northamptonshire’s Blackpool-born all-rounder Richard Gleeson returned to his old Stanley Park stomping ground to play his part in the leaders’ 102-run victory over Leyland. Blackpool were asked to bat and their total of 203-9 owed much to a fifth-wicket stand of 89 between Andy Furniss, whose 61 from 65 balls included 10 fours, and professional Jovaun van Wyngaardt, whose 46 from 81 deliveries featured six fours. Andrew Makinson removed both on his way to 4-50 from nine overs but the total was way beyond Leyland, who barely scraped past 100. Nobody managed more than 16 and seven of the visitors failed to reach double figures as Leyland were all out for 101 in 39.3 overs. The wickets were shared, seven of them falling to lbw decisions, as Matt Grindley led the way with 3-19 from eight overs. Gleeson followed his 19 from 12 balls with 2-17 from eight overs. Despite their excellent start, Blackpool still can’t pull clear of second-placed St Annes. The first division’s only other unbeaten side remain just three points behind after their five-wicket win at Chorley. The hosts were all out off the final ball of their 50 overs for 174, a solid effort after their top four had managed only 20, two of them falling to Jamar Ifill on his way to 4-62 from 17 overs. Ship-steadying duties were performed by Will Moulton with 40 and number eight Alexander Howarth, who top-scored with 43. Tom Higson took 3-56 from 16 overs. St Annes then reached a winning 176-5 with nine overs remaining, captain Nathan Armstrong laying the platform with a season’s best 79. The captain was one of Edwin Moulton’s four victims (for 40 off 13 overs) but St Annes professional Amar Ullah chipped in with 35 to ensure his side kept the pressure on Blackpool. Like Blackpool, Fleetwood won by 102 runs, polishing off visitors Garstang for just 93 to get back on track after successive defeats. The hosts were put in at Broadwaters and the cornerstone of their 195-6 was the fifth-wicket combination of Adam Sharrocks, who hit an unbeaten 59 from 52 balls with six fours and a six, and player/coach Liam Castellas, whose 65-ball 55 featured six fours and two sixes. The Gargstang reply lasted just 36.1 overs, the only real resistance put up by Matthew Crowther with 25 batting six. He fell to Alex Ryder, who took 3-17 from 5.1 overs, while Damien Hutchinson recorded 3-22 off four. The win lifts Fleetwood two places to fifth and closes the gap on Garstang to three points. Champions Netherfield are up to third after a 132-run home win over Fulwood and Broughton. Not even Lancashire’s Steven Croft could spare Lytham a second successive 10-wicket home defeat which dumps them into the bottom two of the Liverpool Competition’s ECB premier league. Croft’s first Lytham appearance of the season seemed more of an inspiration for third-placed Bootle, who put their hosts in and dismissed them for 105 in 37 overs. The former Red Rose captain was caught for eight off Christopher Liptrot, who single-handedly reduced Lytham to 44-5 on his way to figures of 5-46 from 15 overs. Matt Shawcross then put on 51 for the sixth wicket with Matthew Taaffe only for Lytham to tumble from 95-5 to 105 all out, William Purser skittling the tail to finish with 4-39 from 14 overs. Bootle then required just 19.4 overs to seal victory at 110-0, Vishal Tripathi hitting seven fours and three sixes in his 64, and Will Hall four fours in his 40, both facing 59 balls. Croft was as economical as any of Lytham’s bowling quarter, his five overs going for 23, but this fourth defeat in seven games leaves only winless New Brighton below the Church Road club. All the Fylde coast clubs have now been eliminated from the ECB National Club Championship following Blackpool’s four-wicket home defeat by Furness on Sunday. Blackpool chose to bat against their visitors from the North Lancashire and Cumbria League premier division in this third-round clash. Despite the absence of club professional Jovaun van Wyngaardt, several Blackpool players got in at Stanley Park but none could go on to a big score as the hosts closed at 156-9 from their 40 overs. Wicketkeeper Ben Howarth, with 29, was the pick of five Blackpool batsmen who made at least 18 but could not go on to 30. The Barrow club timed their reply well to reach a winning total of 157-6 with three deliveries left. Furness will face Ormskirk of the Liverpool Competition in the group four final in three weeks. Ormskirk were 34-run winners over the St Helens side Rainhill, who had eliminated both Fleetwood and St Annes in previous rounds.